I finished a quilt because my cat threw up a purple hairball on it, and the hairball saved the quilt. If you’ve been following me for a while, you may know that I have two cats - Rufus and Vesper. Rufus is the orange three-legged one, Vesper is the little black one with amazing green eyes. Vesper has a horrible habit of eating my finished knitted objects. To placate her chewing hobby, I let her keep some of her chew toys (formerly my knits) so that maybe she’ll be content with the one she’s currently chewing and not start eating a new one. Hope springs eternal, right? The chewing of the knits means that the hairballs in my house are technicolor beyond belief. The reason I hadn’t finished it and didn’t want to work on it is that I realized I made a poor fabric choice. I believed my fabric store when they marked a product “quilting cotton,” and that’s not at all how I would describe the fabric. It softened while I sewed it in a way that makes me concerned it’s just not going to hold up, and I have little hope for a long life for this quilt. It’s really depressing to put a huge amount of time, effort, and money into a project and then not feel good about it because of one crappy material - and of course it’s the material I used for the sashing AND the backing. Harumph. So there I am, with the quilt on my machine table, trying to get around to doing the quilting, and then Vesper turns it into a day bed. Now it’s covered in cat hair, and I want to work on it even less. And then, dear thing that she it, she gacks up a hairball consisting of yarn from a former favorite shawl made from funky yarn I bought in China, and BAM! Giant purple stain. At this point, I’m pretty sure the quilt is going to have a purple stain forever, and I think to myself that there’s nothing to do but finish it and wash it and see how bad the stain is. So over the course of a week, I finish the quilt. Lo and behold, the stain comes out. The sashing and backing fabric is doing about what I thought it was going to do - it’s tracking and generally making a nuisance of itself invisible to everyone but me. But you know what? The (slightly crappy) fabric makes the quilt so soft and cozy - perhaps the lightest, softest quilt I have ever made. It’s like a well-worn tee shirt that you enjoy wearing all the more because it’s coming to the end of its life. The purple hairball saved the quilt because it helped me see it through a new lens - the lens of utility. 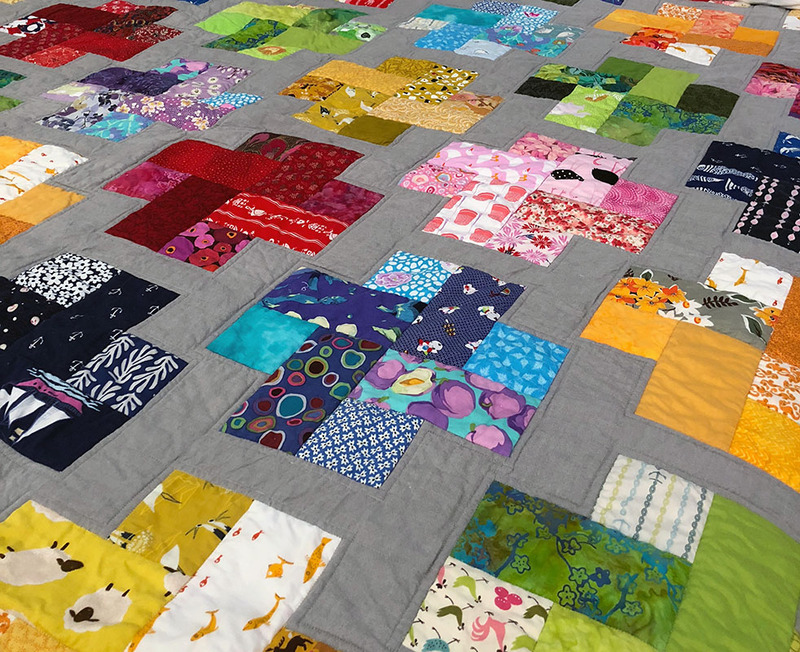 I was so caught up in what was wrong with the quilt as an art project that I lost sight of the point of the quilt as a household textile: to be used. And rather than being the magnum opus of my quilting career, it is doing what it should be doing, namely collecting cat hair and baby drool. It may not last forever, but it’s here for now. At least until the next purple hairball.